The Pedagogic Service project is part of the National Science Digital Library (NSDL) sponsored by the National Science Foundation. The goal of the Pedagogic Service is encourage educators to reflect critically on their own teaching practices and to support them in exploring new pedagogies. Building on a successful model in the geosciences, we have created a library of pedagogic methods and a collection of activities which exemplify each method. 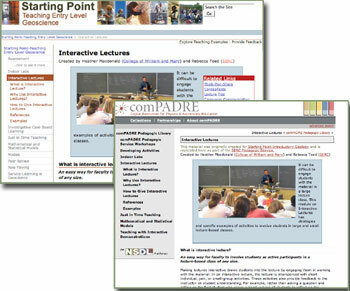 The complete library is available through the Pedagogy in Action portal. Additionally, the library is used by our partners to create customized pedagogic portals for their own websites. Each portal links together information about pedagogic methods with examples of their use. For example, comPADRE, a digital library supporting physics and astronomy education, has created a physics pedagogy portal with pedagogic methods of high interest in teaching physics and example activities appropriate for physics classes. The pedagogic portal is fully integrated into their existing website. Reuse of pedagogic materials across multiple sites as facilitated by this service. The library of modules and activities is continually growing through the contributions of our partners. Currently it contains information over 30 different teaching methods and over 700 examples of their use. The activity collection is still dominated by the original collection developed for the geosciences but there are also examples from statistics, physics, biology and mathematics. New partners can draw from the existing library to quickly build collections relevant to their own communities as well as contribute new modules and activities that will find new audiences as they are reused by other partners. The service also fosters a community of practice around the challenges of engaging educators in meaningful consideration of pedagogy. Expertise is shared through conversations among partners. The tools and underlying processes used by the service have also been refined to reflect and reinforce community wisdom. All of this activity is facilitated by the SERC Content Management System. This authoring, sharing and digital library environment underpins all the sites at SERC and serves as the home for the collections of pedagogic information and example activities. In support of this project this system has been adapted so that it can display customized versions of the collection with a look and feel that matches each of our partner sites. This allows each partner to present their users with pedagogic information that acts as a coherent part of their existing site without the need to maintain the content within their existing system. The system enables the individual educator who (working within their own community through one of our partners or individually) contributes a successful teaching activity to maintain a sense of ownership and control over their contribution. At the same time that contribution can be reused by other partners in other communities. At all points and for all uses, materials are attributed to the specific author of the materials, the sponsoring center or program(s), and the home institution of the author(s). Thus, reuse by others provides a broad dissemination mechanism and give the authors proper credit for these materials. Manduca, C., S. Fox, et al. (2008). Bringing Research-based Pedagogies into Use: Digital Libraries Supporting Faculty Professional Development. National Science Digital Library 2008 Annual Meeting: STEM Research and Education in Action. Washington D.C.
Fox, S., Manduca, C. A., Iverson, E., (2005). Building Educational Portals atop Digital Libraries D-Lib, 11(1). See About our Partners for more information. This is sponsored by the National Science Foundation Division of Undergraduate Education (Grant DUE-0532768). This project is supported by the National Science Foundation as part of the National Science Digital Library. Any opinions, findings, and conclusions or recommendations expressed in this material are those of the author(s) and do not necessarily reflect the views of the National Science Foundation.